We can create luggage tags in any shape and customization you’d like. 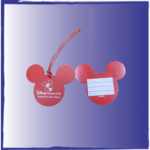 You see from this image that we did they Mickey Ears for a distributer whose customer is the Disney Vacation Club. We Manufacture here in USA at our San Diego facility. We offer decoration on site; just send us your blanks. In addition, we can supply warehousing (110,000 sq feet) fulfillment, assembly and packaging.